Make room in your wardrobe for these wear-with-anything boots. Finishing just below the knee with a chic pointed toe and a snug fit, they've got plenty of stretch and a sensible heel that's perfect for those don't-have-a-minute-to-even-stop-for-lunch days. 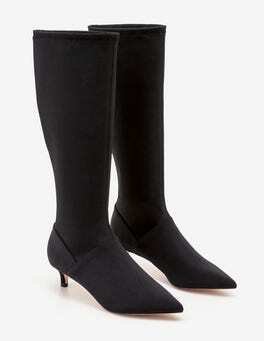 Think of these soft, knee-high boots as the foundation of your shoe-drobe. They’ve got plenty of stretch, a snug fit on the calf and a totally walkable block heel for ultimate comfort. 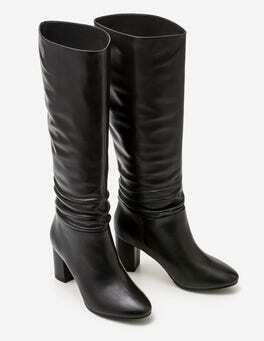 Just pull them on over tights or jeans and you’re good to go anywhere. 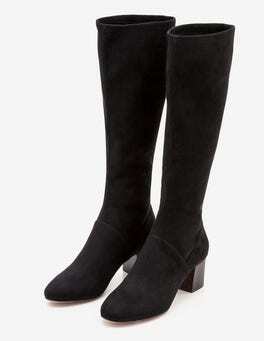 Our classic knee-high flat boots have the edge over the competition – a pretty, scalloped edge, to be precise. 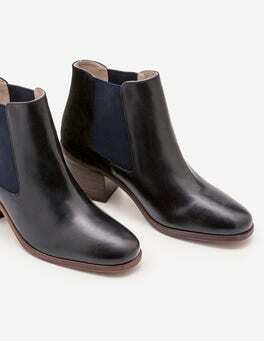 This subtle rounded-toe style in soft leather goes with anything, while the low heel is perfect for all-day wear. A full-length zip and leather pull-tab make them easy to slip on and off. Reach for sophisticated style in our kitten heel boots. 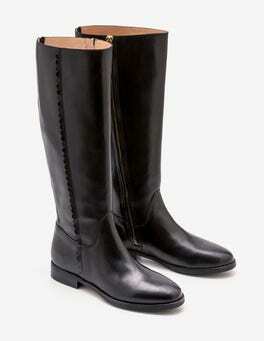 This sleek knee-high is crafted from stretchy grosgrain for a fitted look that's oh-so-comfortable, with no zips to disturb its sleek lines. 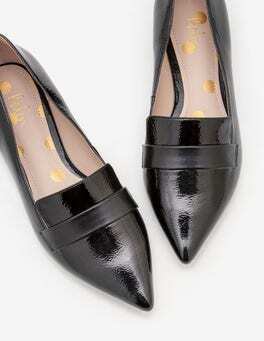 We've added a pointed toe to complement the classic little heel. Everyone needs a pair of classic block-heel ankle boots, but our version stands out from the crowd with a choice of striking luxe finishes. 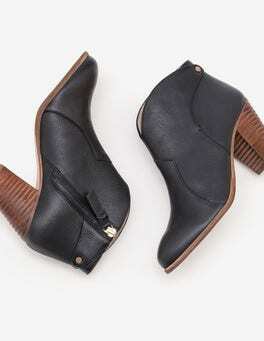 The chunky heel adds some height, but stays comfortable even during long days on your feet. 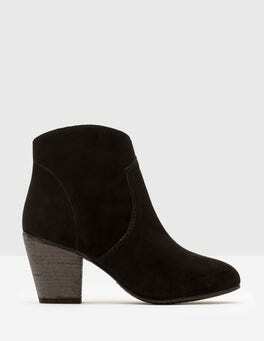 Ankle boots made to slip on and go? Right here. 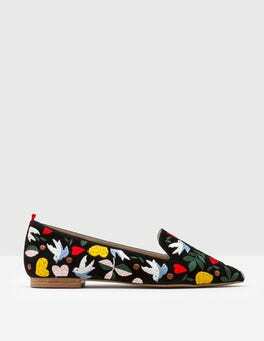 Shoes that go with your dress/jeans/skirt? Yep, they do that too. 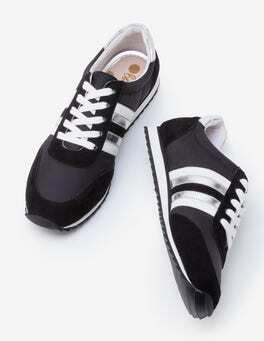 This stylish pair is made from stretchy grosgrain fabric, which gives a slight textured effect. Thanks to the elegant pointed toe and mid-height heel, you'll be party-ready in seconds. Stop the press: your favourite ballerina pumps just got a modern lift. A low, blocky heel retains all the comfort of this classic style, while the luscious suede upper provides a dash of indulgence. 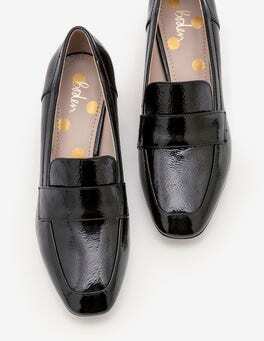 A spotty padded leather insole makes them a dream for all-day wear. 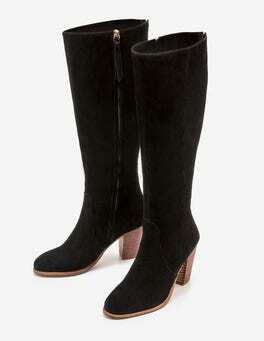 We've crafted our sleek suede boots with a sophisticated pointed shape and eye-catching pops of colour or embroidery. An elastic side means you can easily pull them on and off again at the end of a long day. 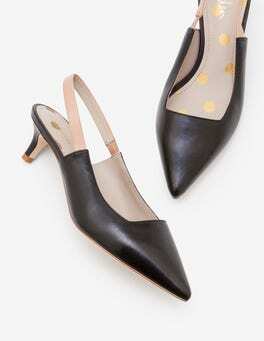 These statement Mary Janes are here to add a playful touch to work and weekend outfits. We've added a contrast back tape and circular buckles for extra fun. 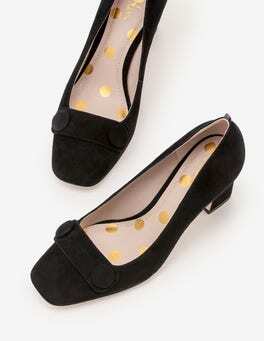 And thanks to padded insoles, these low heels stay comfortable from morning to midnight. 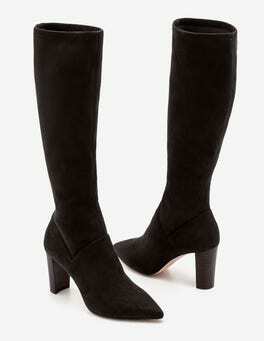 Play it chic in these suede, go-with-everything boots. Now updated with an exposed, gold zip. Team with bare legs and a knee-length dress, or cropped jeans and a colourful clutch. These wear-me-anywhere boots come with serious pavement power. 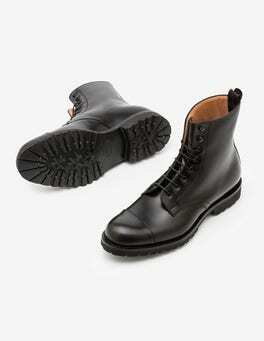 Featuring a trusty round-toe shape, these boots were built with comfort in mind. Choose from animal-print pony or supersoft suede, then admire that splash of colour on the inside back zip. Now, where to power walk to next? 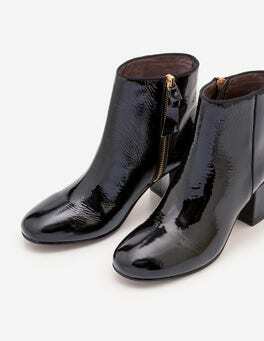 Take your shoe collection to new heights with these classic heeled boots. 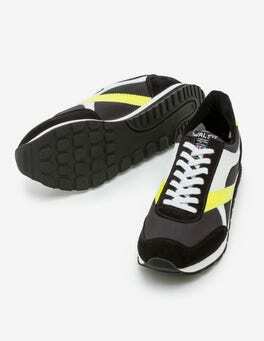 They're easy to pull on, crafted from butter-soft suede and have a smooth leather lining on the inside. Use them to add impact to your skinnies, or wear them with a dress for all the attention. Add a dash of sophistication to that floaty dress, your favourite jeans – well, anything in your wardrobe – with these timeless ankle boots. It’s the details that make them extra special (and an everyday essential) – think luxuriously soft materials, colour-pop contrasts and grosgrain zip pulls. Elegant, comfortable and oh-so versatile – ballerina shoes really do have it all. Ours come in a choice of luxurious fabrics, with a charming bow and trim lending the perfect every-attention-paid-to-detail finish. A little touch of luxury never goes amiss. These cotton stretch velvet trousers feel super-special but are versatile enough for every day. 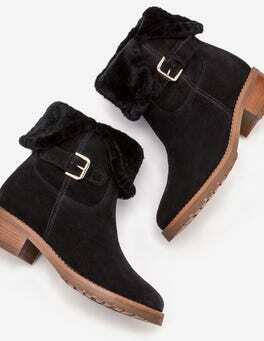 Pair with a plain white tee and some chunky ankle boots for an easy, get-ready-in-5-minutes outfit. 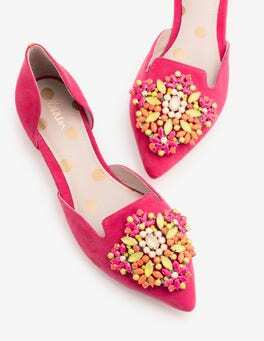 Feel happy from the ground up in these cheerful colourblocked flats. 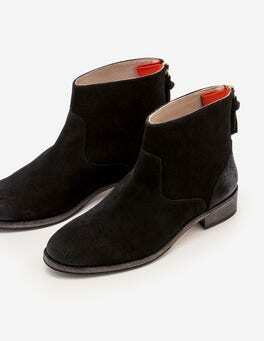 They're cut from the softest suede with a leather lining and tonal grosgrain tape at the back. Their open-sided shape makes them easy to wear – with jeans or dresses, at work or play. We've refreshed these classic court shoes with rich velvet and double-strap detailing – so they're twice as nice as before. The mid-height make it easy to dash straight from your desk to a romantic dinner, while the grosgrain piping and ribbon up the back make for an elegant finish. …these striking slingback sandals will dress up your warm-weather wardrobe. 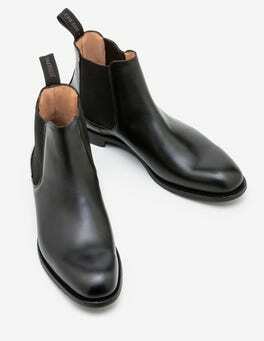 They've got a square toe that lends a contemporary edge, with a buckle fastening for comfort. Classic tan or black leather will be all-season-long staples or choose rouge suede or statement snakeskin effect for exotic impact. You and these strappy flats are going to become very well acquainted. Both comfortable and sophisticated, they have a grosgrain bow embellishment on the front and contrasting tape at the back. Choose either traditional tweed or Italian velvet, and wear every day from now on. These loafers look so smart and sophisticated that nobody will suspect you feel like you're wearing your favourite slippers. 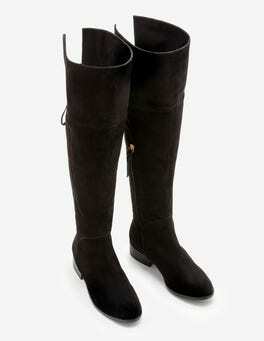 With a soft shearling lining and a chunky sole, they're comfortable, while the pony and suede upper keep them elegant. Going straight from work to rooftop rosé? Our versatile courts have got you covered – well, your feet anyway – with an elegant pointed shape, textured exterior and patent bow. 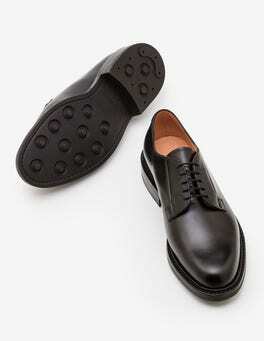 Oh, and a polka-dot insole means comfort is always on the agenda, however busy your day gets. Can't decide between brogues, kitten heels and court shoes? This design is all three in one, with refined brogue detailing, a vintage-inspired heel and a sophisticated pointed toe. The padded leather insole with bonus spotty print makes them super comfortable too. Introducing: a reimagined take on the court shoe. This cutaway pair is crafted from supple suede or Italian pony leather and has a front strap as well as a contemporary mid-height heel. 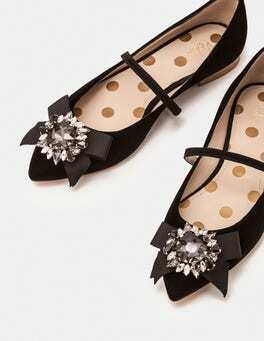 Who says flats can't be the most glamorous shoes in the room? 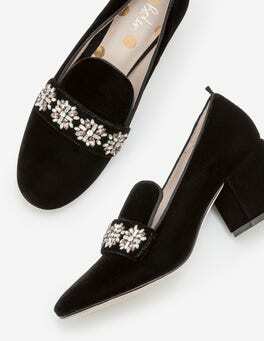 With intricate, colourful embroidery and pretty motifs, all eyes will be on your elegant pointed-toe slippers. 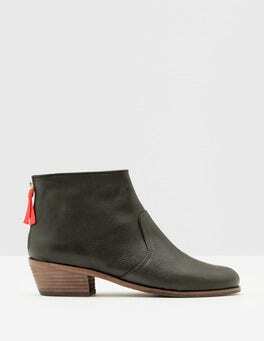 Made from buttery soft suede, they're finished with a delicate grosgrain trim on the back. When shoes need a stylish spin, fringing is the answer. 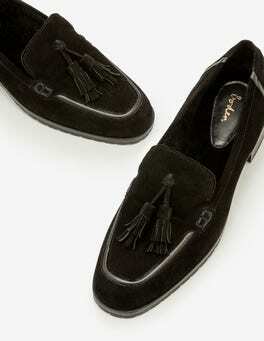 Which is why these suede loafers come with eye-catching detail on the front. A surprise spotty lining adds extra joy and keeps things comfortable. 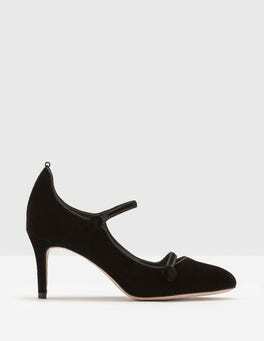 The only thing flat about these pumps is the heel height. 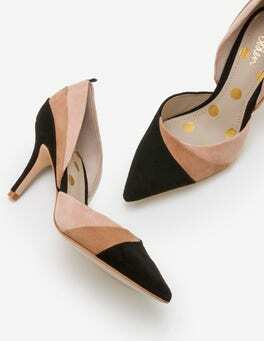 Give your inner ballerina a bit of extra pizzazz with wavy detailing in soft suede, pony or patent leather styles. These super-versatile shoes look great paired with dresses, denim and everything in between. Work at 9am, school run at 4pm and then dinner afterwards? You need a court that's comfortable and good looking too. Thanks to its low block-heel, these shoes are go-all-day wearable. The bright suede options are ideal for making your outfit pop. Jeans, meet your new partner in crime. This short-sleeved slub-cotton T-shirt has a slightly relaxed fit that’s as flattering as it is comfortable. Its simple V-neck shape can easily be dressed up – try a statement necklace and ankle boots. 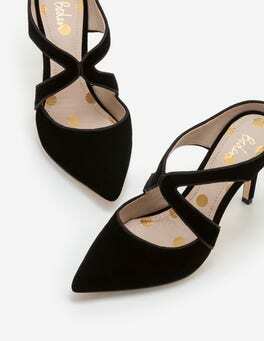 These kitten-heel slingbacks will bring a pop of joy to every outfit. Combining contrasting colourblocking with a spotty lining, they're a head-turning pair of shoes. Go refined in Italian snakeskin printed leather or high impact with bold hues: there are plenty of chic options to choose from. Buckle up: these strappy sandals, with modern metallic accents, are ready to take you absolutely everywhere. The platform rope sole gives you just the right amount of height and there's a leather insole and straps for comfort when on the go. Your go-anywhere lace-up trainers have received a few sartorial updates. Side stripes offer an athletic aesthetic and a contrasting toe panel adds extra interest. Comfortable and seriously stylish, they’re bound to be your new go-to. …flats are proof you don't need heels to make a statement. Choose from different finishes, all featuring a treasure trove of jewels, contrasting grosgrain trims and perfectly pointed toes. 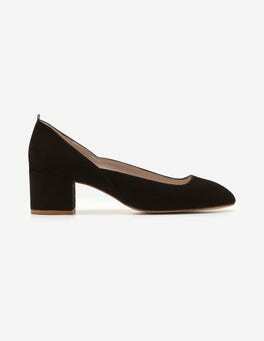 Crafted from wonderfully soft suede or canvas, slip them on with a little black dress to let them shine.